I’ve been asked about a recipe for stuffed bell peppers a lot, so I thought it was high time to share one. 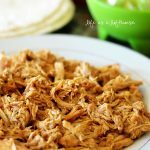 This recipe I’m sharing today is my favorite. 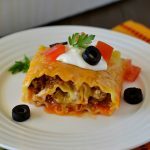 They’re totally delicious and stuffed with all kinds of good things; beef, Mexican rice, enchilada sauce, cheese…. See, I told you they were yummy. 🙂 But I think the best thing about them is that they’re baked in the crock pot! 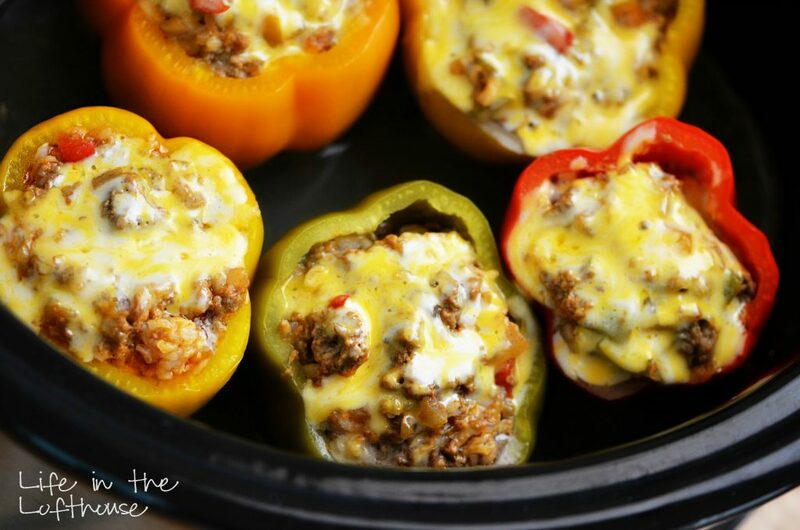 These stuffed peppers are melt in your mouth good! I served ours with just a simple side salad and it was one of the best dinners I’ve had in awhile. 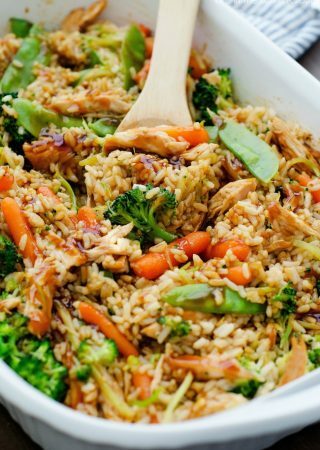 They’re certainly amazing as is, or you could customize your own by using chicken instead of beef, or exclude the meat and add more veggies/rice for a vegetarian version. I think any way you make them, you will love! Cut the tops off of each bell pepper. Remove any seeds and stems from the inside. Dice the tops of each bell pepper. Set aside. 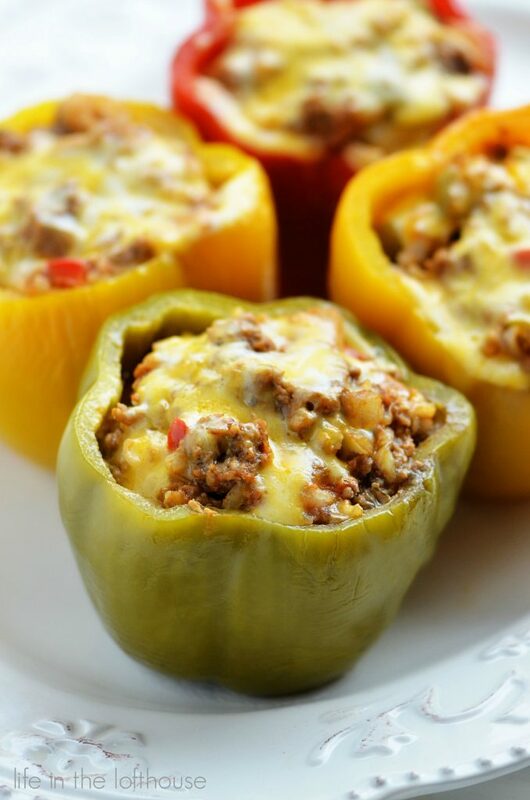 In a large bowl, combine the raw ground beef, enchilada sauce, onion, rice, diced bell peppers and ½ cup of the cheese. Season mixture with salt and pepper. Stir to combine with a spatula. Stuff each pepper with the ground beef mixture. Fill crock pot with one inch of water. Place bell peppers inside. Cover with lid and cook on Low heat for 6 hours OR on High heat 4 hours. 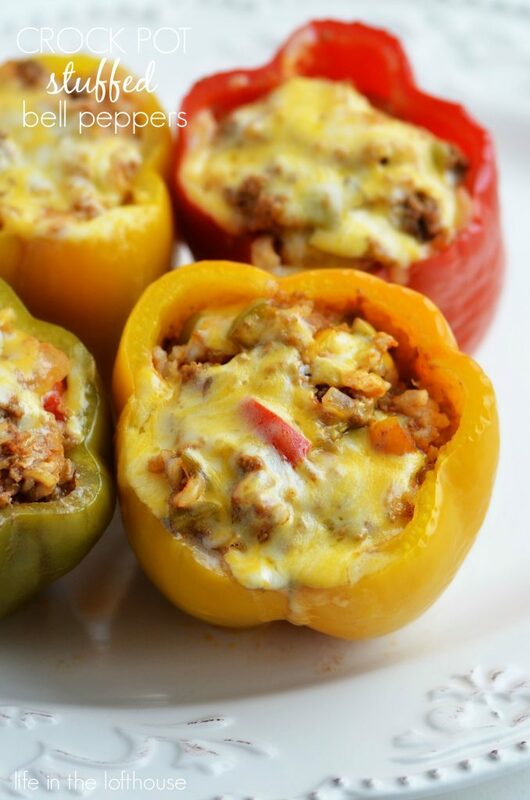 Top each stuffed pepper with the remaining shredded cheese. Cover with lid until cheese has melted. Serve warm with favorite toppings. Enjoy! Just wondering if the water can be replaced with tomato sauce? I also added 1 C of salsa to the taco/tomato sauce mixture. We like lots of sauciness to spoon over the cooked peppers. Made these today and they turned out delish, so easy too. Maybe next time, I’ll heat up another can of enchilada sauce and top them. What size crock pot is this recipe for and also if needing to cook more peppers in a larger crock pot , how far up does the water need to cover the peppers? I used my 6-quart for this recipe. The water just needs to be at least 1/2 inch up the peppers. The waters purpose is only so the peppers don’t stick to the bottom. This looks great! What is meant by “Mexican rice?” Is it long-grain, short-grain, Spanish rice (e.g., Rice-a-Roni), or something else? I used la preferida boxed rice. Takes 1 and 2/3 cup water and I add 1 teaspoon taco seasoning and it takes 8 minutes to fix this rice and you can use it for all meals. I used to make my rice the mexican way but it takes too long. I always thought you couldn’t use raw ground beef in a crock pot because it is suppose to be cooked at minimum temp. of 360 degrees? I know it is cooking for a longer period and would be cooked through, but heard that at the beggining stages it should be a higher temp?, If I do anything with ground beef I brown it first and then put it in a sauce in the crock pot, I would love to skip that part if I don’t have to. I can’t wait to try this recipe! 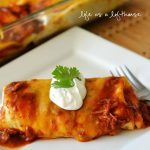 What can I substitute the red enchilada sauce with? Is there harm in leaving it on low for more than 6 hours? I wanted to start it in the morning and finish it at dinner time. Mine was on LOW for 8 hours and then WARM for 2 and turned out fine…. perfect for a work day! 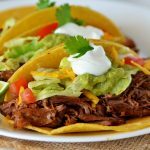 I tried these but unfortunately I didn’t have mexican rice so I had to make homemade mexican rice and I think it may have thrown the results. I like the stuffed peppers just fine, but they lacked flavor. So I am going to try this again but get more spicy ingredients to kick it up a notch. I always use half ground sirloin and half hot sausage and quinoa instead of rice. 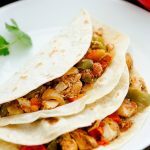 I cut up Brussels sprouts and add those as well and usually a hot or Korean sauce and they are yummy..
Love this idea but should the bell peppers have ended up with liquid 3/4 of the way up…peppers were really soggy. 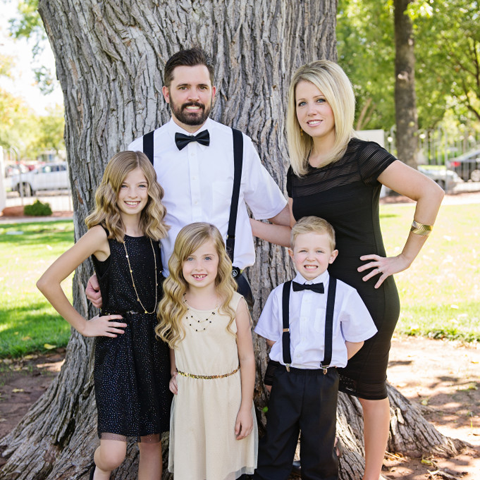 Is this how it should be? Trying to figure out how to eliminate all the liquid. Flavors were great though. Any thoughts? Shannon, the recipe calls for 1 cup of water to put in the crock pot, so if you’re using a smaller crock pot the water may fill up higher. My crock pot is a 6 quart so it only filled mine with an inch of water. I will fix the recipe to clarify that. Glad you liked the flavor, though! Wonder if you could prepare and freeze these? Take them out that night before preparation and thaw in the fridge, then into the crock pot after they’re thawed. Thoughts? I’m wondering about the amount of water. I only had just enough in there so they didn’t stick to start with but by the end they were almost swimming. I had to take them out and remove some liquid and then put the peppers back with still like an hour left to cook. Any ideas? Feel free to share in your circles! Would it be alright if i stuffed the peppers with the mixture and then put them in the fridge overnight? And then put them in the crockpot in the morning. This would be great if I had cooked the meat first. This sounds yummy! Will have to try it. Thanks for sharing! I use a can of Spanish rice and have for nearly 40 years. That’s my m-i-l’s recipe. Do you cook the rice before putting it in the pepper, or will it cook while in the crockpot?